As we get set to close out this year and brace ourselves for what appears to be a tsunami of apostasy headed toward the mainstream of the visible church Apprising Ministries says a heartfelt thank you to those who’ve been supporting us in prayer and financially. We are grateful for these fellow soldiers willing to sacrifice along with us so that AM can stand as a lighthouse of information to help guide the many who are without good local churches or who have to stand for truth within fading fellowships now being covered with this growing spiritual darkness. Another way AM stays on the cutting edge of these troubling spiritual seas is with the assist from readers sending in tips concerning issues that are popping up to the surface now like spiritual icebergs. 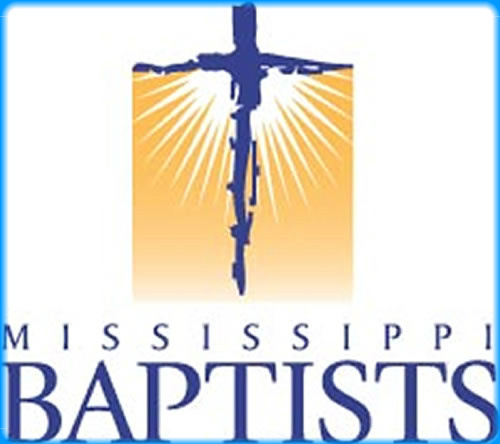 For example, the following from the Mississippi Baptist Convention Board (MBCB), which is the arm of the Southern Baptist Convention for affiliated local churches in Mississippi. I’ve been monitoring Intel along the Internet Front for years now so I can tell you that a major factor contributing to the rapidly growing apostasy within spiritually spineless evanjellyfish is the spread of Counter Reformation spirituality through Contemplative Spirituality/Mysticism (CSM) ala gurus Dallas Willard and his spiritual twin Living Spiritual Teacher and Quaker mystic Richard Foster. You need to realize that it’s even slithered deeply into the weakened heart of the evangelical community as you can see e.g. 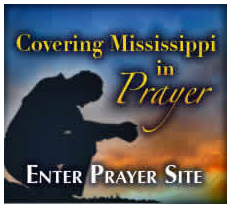 in Moody Publishers Publishes Book On Contemplative/Centering Prayer. Because it’s my job, here I’ll tell you again that CSM is not a neutral practice; and know this, my research shows that once someone begins dabbling in this they almost immediately begin to drift away from proper Biblical doctrine. It is possible to dance in a minefield, but it doesn’t make it a good idea. Sure, to paraphrase Phil Johnson, you can rummage through the garbage and find enough edible scraps to make up a meal; but I’d rather eat one made with fresh food. The church visible is now suffering much from the libertine legacy of the sinfully ecumenical neo-liberal cult operating within the Emergent Church aka the Emerging Church with its postmodern obfuscation. According to Webster’s Dictionary, a labyrinth is “a structure containing an intricate network of winding passages hard to follow without losing one’s way; maze.” In Greek mythology “such a structure built by Daedalus for King Minos of Crete, to house the Minotaur,” a half-bull, half-man creature which was annually fed “seven youths and seven maidens from Athens.” A labyrinth is synonymous with something complicated, perplexing in arrangement, puzzling, intricate, and difficult to follow. Actually I first heard of this kind of thing when I was attending a hyper-Pentecostal Word Faith church early in my walk with Jesus. In fact, it has to do with a whacked view of spiritual warfare and supposedly claiming territory back from demons. My last time there the entire congregation was stomping around the church grounds claiming the church building for Jesus and decreeing new carpet for it. Well, the only claiming and decreeing I did as I left that fellowship was to tell the Lord I was sorry that apparently I just don’t get it. You may find it interesting that later when I planted a mission church in that town, unbeknownst to me, the mother church overseeing the plant actually decided to put it in that very building. Apparently this was another example of the Lord’s sense of humor. 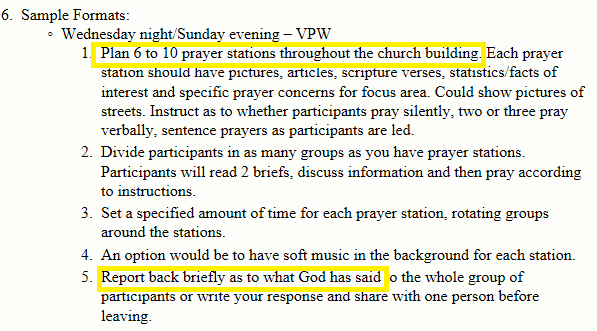 Be that as it may, notice that point number 5 above is very Henry Blackerby-esque in that one is expected to believe they’ll receive highly subjective direct revelation from the Lord during their time in the prayer walking prayer stations: Report back what God has said. Again, the SBC is reputed to discourage this kind of quasi-charismania; but based upon this we have more reason to say it’s actually the opposite. Really? Southern Baptists need to turn to a man who died a slave to the false gospel of the long apostate Roman Catholic Church and was a leading teacher of spurious CSM to learn about eternal life? For the benefit of whomever wrote this, solitude, listening, and even prayer also refers to the crown jewel of CSM; a form of meditation in an altered state of consciousness commonly known as Contemplative/Centering Prayer (CCP). Again, MBCB is not alone as Southern Baptists recommending the deceptive teachings of Quaker mystic Richard Foster as you can see in John Piper, Rick Warren & Foster-Willardism. From my years of studying Foster’s CSM mythology I can tell you that his musings absolutely do draw “from many different traditions and experiences.” Indeed it does; and you need to know that this even includes apostates and pagan religions. As we experience the unifying grace of recollection and the liberating grace of beholding the Lord, we are ushered into a third step in meditative prayer, the prayer of listening… When we come to the prayer of listening, we put away all obstacles of the heart, all scheming of the mind, all vacillations of the will. There is a hushing of all “outward and earthy affection,” as Fenelon reminds us. A graphic phrase from St. John of the Cross, “My house being now all stilled,” instructs us in the quieting of all physical and emotional senses. The experiences of recollection and beholding the Lord have done their work. Notice that Richard Foster, as a mystic Quaker, refers to two other apostate (at best) mystics concerning meditation. Just last year in Kay Warren, Henri Nouwen, And Contemplative Spirituality I explained to you that François de Salignac de la Mothe-Fénelon (1651-1715) aka Fenelon was a mystic and a very devout Roman Catholic bishop from France. He was especially known for his catechizing people into Roman Catholicism. In the case of CSM and its CCP, which is the spurious spirituality of Rome’s corrupt Counter Reformation, stop judging it by its apparent piety and judge it by the right judgement of Holy Scripture as did God’s Reformers when they rejected it (cf. Acts 17:11). It’s well past time to recognize the rancid fruit and sinful ecumenicism of this CSM; e.g. consider CSM guru Richard Foster, a key mentor of the Emerging Church with Dallas Willard. This warped and toxic neo-Gnostic serpentine spirituality, which slithered out from Rome, was core doctrine of the EC from its hatching in hell circa 1997. Its practice has produced the fruit of a more clearly delineated postmodern Progressive Christian theology—a Liberalism 2.0—that the EC often refers to as “big tent” Emergence Christianity; in other words, the Love Wins mythology of former EC rock star pastor Rob Bell. This all is also a huge part of what Living Spiritual Teacher and EC guru Brian McLaren, one of the unholy EC trinity of apostates along with universalist EC pastor Doug Pagitt, and his friend Dr. Tony Jones—the progressive “theologian in residence” at Pagitt’s Emergent Solomon’s Porch—began laying out systematically in his book A New Kind of Christianity. All of these ravenous wolves are dedicated practitioners of this CSM. Finally, stop and think about this: Richard Foster’s Christian doctrine is so compromised that he’s listed as one of the great teachers of spirituality as part of the interspiritual Living Spiritual Teachers Project right alongside false religious teachers like Deepak Chopra, the Dalai Lama, Brian McLaren, Thich Nhat Hanh, Eckhart Tolle, and Marianne Williamson. I wonder, how long before the SBC also recommends such as these? Richard J. Foster. Sanctuary of the Soul: Journey into Meditative Prayer (Renovare Resources Renovare Resources) (Kindle Locations 532, 537-539). Kindle Edition.